Dangard Ace takes place on a future Earth in which nearly all natural resources have been depleted. People have begun looking toward other planets to survive, in particular the fictional tenth planet, Promete. Although people had hoped to peacefully begin settlement there, disaster strikes as the first explorers are destroyed by betrayal. After this event, an individual named Mr. Doppler leaves toward Promete on his own ship, and declares himself Chancellor of the planet. Using Promete's resources, Chancellor Doppler constructs a vast military force greater than that of Earth's. He forbids anyone approaching the planet, under the insane belief that only he is entitled to it. To gain control of Promete, the governments of Earth begin constructing massive combat robots. Doppler is able to attack and destroy all robots before they are completed, except for Dangard Ace. The forces sent to attack Dangard's base where destroyed because of the efforts of Captain Dan. Nothing is known of this mysterious man, save that he previously served Doppler while under mind control. Takuma Ichimonji, son of the man who betrayed the initial Promete exploration team, becomes a cadet at Dangard's base. Ichimonji hopes that he might restore his fathers honor by fighting against Doppler's forces. 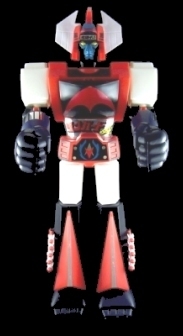 Dangard Ace was never released in the USA as a Jumbo Shogun Warrior, yet he was featured in the range of small toys and was one of the main robots in the Marvel Comic.